Spearhead Miniatures are a fairly new company producing 1/35 resin figures and 1/9 scale busts and full figures. I’m happy to say that so far all their subject material has been British/Commonwealth orientated. This is the first look I’ve had at their 1/35 scale figures and for openers I’ve chosen the Wounded British Infantryman, kit No SM35006. This figure was sculpted by Pete Morton, and I’ve been a fan of Pete’s work for some time now since he brought us the Royal Navy Sailors and London Policemen. The figure comes packed in a fine sturdy professional looking box. The figure itself is contained within a zip plastic bag and was surrounded by suitable packing to protect it in transit. On the top of the box is a colour picture of the painted figure to aid painting, and the manufacturers name and product number/description. This is a simple figure of 3 parts. The body, legs and arms are cast as a whole, with the head and a backpack being separate items. Cast in a light cream resin I could detect no damage or air bubbles on the product. 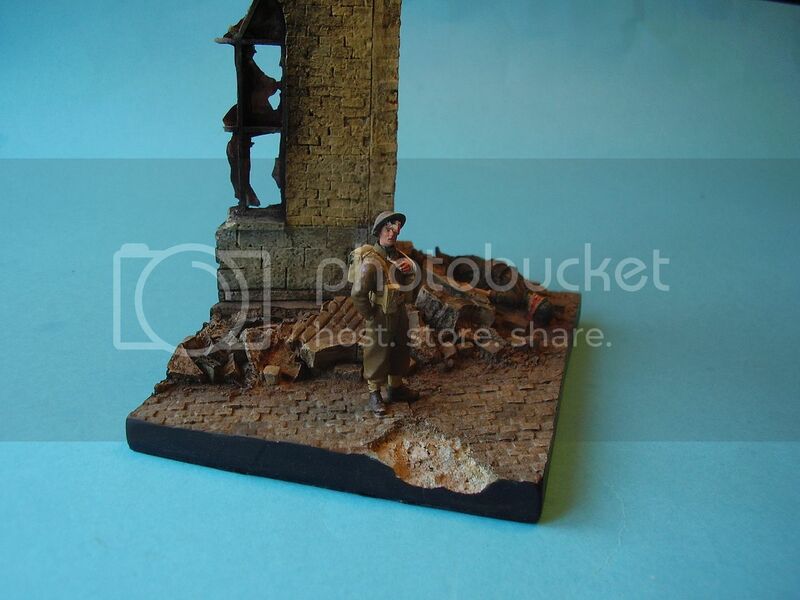 The figure depicts a standing wounded British Infantryman, posed with the legs apart, right hand in the trouser pocket and the left arm wrapped in a sling at chest height. Dressed in what appears to be 37/40 battle dress with the pleated top pockets on the DB blouse, the uniform depicts all the correct detail, although I could see no hip pocket on the DB trousers. The uniform itself has nice folds and natural looking creases and should paint up very well. I was glad to see the shoulder straps running over the DB epaulets and not through them. To complete the body, the figure wears anklets and ammo boots both of which have fairly good detail. Around the figures neck is a kerchief, giving him a bit of individuality. Over the uniform the figure wears 37 pattern web equipment, consisting of belt, shoulder straps, left and right ammo pouches. Hanging on the left hand side is the short stabbing bayonet for the No 4 rifle. To complete the webbing you get a separate back pack. The pack shows evidence of a ground sheet under the straps and the side buckles, but the strap buckles are a bit weak on detail. The front brasses, shoulder buckles for the pack and rear buckles are all in evidence, although the detail on the rear brasses is very fine. The left and right ammo pouches are nicely done but perhaps a bit too square and packed full for a wounded soldier. The head, a separate item shows the face of a youngish looking man. The Mk II helmet is pushed back on the head, and the chin strap is looped onto the rear edge of the helmet. Over the left eye is a bandage. The facial detail is very good. There are not that many wounded British soldiers around and this figure is a welcome addition to those that already exist. The body proportions are excellent. This is a neatly cast figure in what I think is a very natural pose, with the overall level of detail being very good. The addition of the short stabbing bayonet would make him appropriate for NWE 1944 or the late Italian campaign. The separate pack is a nice option, and with a little work other than removing the shoulder brasses for the pack, bayonet and under arm pack straps you could easily leave the pack off, add a long bayonet and use him in an earlier setting such as Dunkirk. There will be minimal clean up required other than the removal of some flash from under his arms and between the legs, and a sharp X-Acto blade and razor saw are all that would be required to tidy him up and separate the parts form the pour plugs. There was a bit of excess resin to be removed from the back of his trousers and under his right arm, but I did this whilst I was writing the review so no big issue there. The kerchief around the neck gives him a touch of the Irish, and a bit of individuality, but again if this is not to your taste it would be easy to remove it or convert it into a camouflage scarf. The figure lacks a rifle, water bottle and small digging tool, but none of these are critical given the setting. 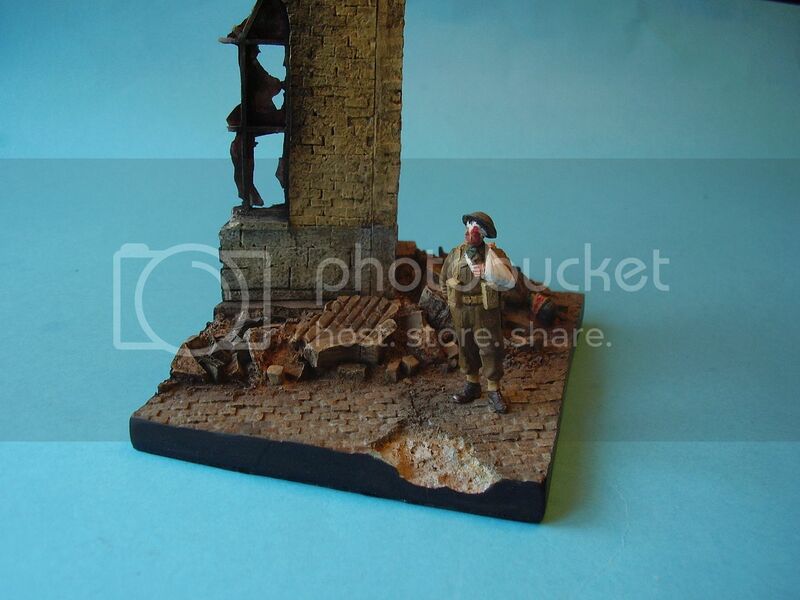 This figure should be of interest to stand alone figure painters and diorama builders alike. He would also be quite useable as a prisoner for Axis modellers. Highs: A very nicely detailed figure, with a good natural pose. Easy to convert to other wartime time frames. Lows: The buckle detail on the back pack is a bit faint. Alan in the pic the legs look out of scale, are they? or is it just an optical illusion?